Today's post is about which method of paper binding works best in which situations. Seems simple enough, but selecting the optimal binding for your needs will save you time and keep you organized. One of my friends hates staples. She doesn't like the way that they leave little holes in the paper. Honestly, I tend to hate paper clips. They slide around and sometimes unintentionally grab other pieces of paper. Use staples for 5 or fewer sheets of paper (sometimes, I go up to 10, since I am such a rebel), if the papers are related and NOT going to be copied, used individually, or used as originals. Some of the things that I currently have stapled together are two page recipes, a group of rules regarding the upcoming school fair booth (that can all be discarded after the fair), and several pages of correspondence about a car wreck that just need to be filed. I wouldn't use a paper clip in the files (as it might grab something else) or for the recipes (where I certainly don't want to lose a page). I do use paperclips if I need to attach something very temporarily to a certain page in my planner. I also use them for master copies of something that I am planning to copy. For example, if I substitute teach and will be doing a back-to-back handout, I'll paperclip the two originals together until I get to copy them. TIP: If you write a big "O" with a yellow florescent highlighter on the original of anything, most copiers won't read the yellow. Teachers do this to make sure they don't actually hand out every copy, including their original, of tests. As a lawyer and business owner, I used yellow florescent highlighters to write the date that I received a document in the office. That way, I could still make clean copies, but always knew which document was the original and had a record of my receipt. I love binder clips. I use them, as mentioned above, when several original documents need to be bound without putting little holes in them. I use them for keeping large projects together. I use them for keeping coupons in groupings and in order by expiration date. I use them for putting together several papers that I will need to bring with me to errands today. When I teach, I use them for holding together turned in assignments. TIP: Buy the cheap black ones, and use a white-out pen to write the class name (Sci, SS, Math), the grade level (7-A, 7-B, 8-B), the purpose (TASKS, To Grade, ERRANDS, To Copy), the project name (Sales, PR, Tanger Project), or any other identifying information. One of my favorite uses of binder clips is to attach a post-it note permanently, if I can't or would rather not write a note directly on the page. By the way, I have a container for paperclips and binder clips on my desk and a stapler, too. Keeping them convenient makes them easier to use. Go visit you tube here to see a video of Loki singing about planners. My kids and their cousins just had lunch. Because one of the kids is a three year old, I got distracted helping him and didn't clean up immediately. There were empty packages of grapes and shredded cheese on the counter. There was a single hot dog, uncooked, hanging out on the counter. Extra tator tots sat on the stove. The chili bowl was out, drying up, making it impossible to clean. Dirty dishes were everywhere. This is a real contrast to the clean-up that I generally do as I cook and prepare lunch. So I timed the amount of time it took to clean up the mess. Yes, 2 minutes. Had I spent those two minutes cleaning up before sitting down to eat lunch, my kitchen would have been clean and tidy. Instead, I had to get back up and take care of the mess. Guess how long I DREADED doing that? MORE than 2 minutes, certainly! When you check the mail, toss the junk, file the bills and write due dates in your planner, and note coupon expiration dates in your planner. When you get home from the store, unload groceries, clear old food out of fridge, and put reusable bags back into the car. Do just a little more, and save yourself tons of anxiety. Over the years, I've made many mistakes with my planner, in particular. Some of them just made it more difficult to use. Other mistakes meant that I didn't use my planner at all and experienced planner fail. So that my Loyal Readers don't feel all alone with their imperfections, I thought I would compile some of my common errors for you, along with solutions. Summer is coming soon and my children will be home with me. I work from home, so this requires a lot of planning. For the most part, I'll try to work after my husband gets home each evening, so that I can do childcare during the day. But to the extent that I am able to work during the day, I'll be able to spend that time with my family at night. Some of the moms that I know are planning summer schedules. I do schedule lots of stuff, like swim lessons and vacations. Those things must happen at a certain time, so they need to go on my monthly planner pages. That is called scheduling. But, given that every week is different (depending on scheduling), the actual daily rhythm of our lives is better as a routine. While learning a routine, I sometimes put it in the Notes/Files section of my planner. But the routine is more of a "do this, then do that" system. It's important that everyone LEARNS them, instead of just writing them down. Our routine is pretty standard, but makes it easy to switch out activities, like play dates and swim lessons. Simple. Flexible. And a ROUTINE which can be changed at a moment's notice, but lets the kids (and the grownups) know what to expect. I don't do a chore chart for my kids. (Read my objection to them here.) But I am tracking their chores in my planner. And, magically, they take them more seriously now that I write it down. Imagine that! The main reason we started tracking is because our kids were watching too much tv and playing too many video games. We don't object to electronics, but we noticed that the kids were not playing, reading, or building. They were plugged in and that was their only recreation. Things had to change. So I took the chores they were required to do anyway, and started tracking. Now, the chore must be done, regardless. But they can now earn electronics time by doing them voluntarily and without complaining or objection. I also wanted to motivate things like reading or playing outside, so I give points for those things, too. 1. Chores are an active project, so they go in my project pages. 2. I put a box in the upper right hand corner to name the project and a sticky note to tab the project so I can turn to it easily. 3. I have a list of chore values. They get 75 points (the cost of 1 hour of electronics) for their normal daily chores, and can earn extra by doing things like reading for 30 minutes, trying a new food, eating vegetables, or playing outside for 30 minutes. 4. I sometimes assign special chores (or they can ask for them). Pretty much, weekends and non-school, non-holiday days always get an extra chore. Some examples include cleaning the bathroom, cleaning the bedroom, helping mommy with the laundry, or cleaning out the microwave. 5. I have a list of things privileges that they can earn. E-time, as we call electronic time, costs 75 points an hour. They do get 1 hour free on non-school days. And if company is over or they are watching a show with mom or dad, we don't charge points. 6. I simply keep a running log of how many points they currently have. It looks like a lot right now, but when summer comes, it won't be enough, and they know it, so they are careful to save up points for the summer time. I see my kids do things, like pick up toys immediately, because they know that they will be the ones dealing with the toys later. I love that! Chore time is pleasant and easy now and I am not so overwhelmed. How do you handle kids' chores? At any given time, a peek into a planner will generally reveal a laser focus on something - perhaps a big project at work, an upcoming vacation, or a party plan. For me, right now, my planner is all about my upcoming cruise. I've only been on a cruise once before, for my honeymoon in 1996, so I am really excited to sail away again. In my imagination, I'll sit by the pool all day with pina coladas delivered directly to my upstretched hands. My children will love Camp Carnival, obviously, and want to spend every waking hour there, while my husband and I enjoy three courses every night. The truth is that dreaming is not the same thing as good planning. Good planning actually takes work. Excellent planning means that I will carry everything that I need on to the cruise ship, but not lift a single thing that I don't actually have to carry. I don't need to make a packing list until 2 weeks out, but that didn't stop me from starting one. So far, I just add things as I read about them (like when I read that Carnival Cruises allow two bottles of wine for two adults in our carry-ons) or think of them (I really need to bring sunglasses). But it's started. A couple of weeks before the cruise, I'll add anything from old packing lists that isn't already there. But I can't wait to plan what I am going to wear. First, I'm a lady, so I need to look nice. Second, I obviously need time to shop for any clothes that are missing from my wardrobe. Silly husband, thinking otherwise! For example, I need to inventory swimsuits and the like and make sure I have enough. I certainly don't want to rewear a wet swimsuit. Yuck! 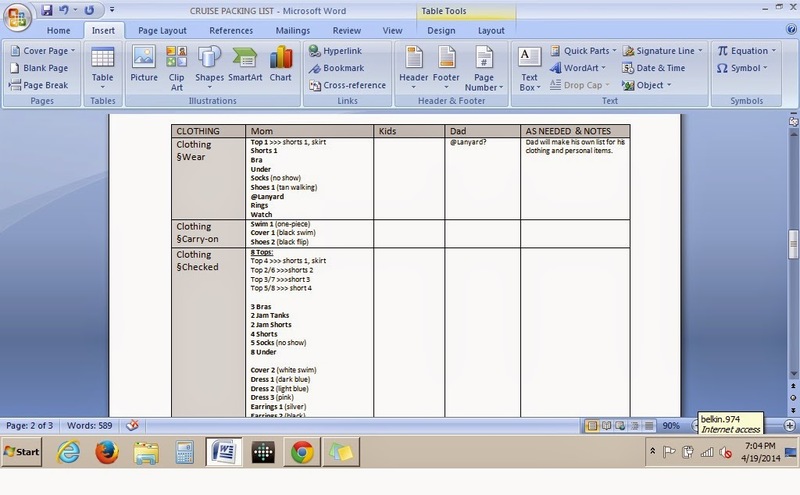 Here's the link to a PDF of my cruise clothes packing plan. This plan is for a 7-day cruise with 2 elegant nights and 3 port days. But it could easily be revised for a shorter or longer cruise. It's also a nice way to set up clothing plans for other trips, whether camping or going to Disney World. 2. Mark the first time you wear each piece (for packing). 3. Mark the last time you will wear the piece (for putting them in the dirty clothes bag THAT YOU REMEMBERED to pack, right?). 4. Coordinate everything with your shoes and accessories. 5. Copy the things you need to pack onto the start of your packing list, as in this picture. I hope to post the whole packing list soon as a PDF. Also, stay tuned for some posts about what stuff to pack for a cruise and a you tube video or two on the process. Sometimes, I write down the assignment and the deadline, but just work on the project, without a plan. Yes, I really do that. Planning the project would have been a complete waste of time. I do have a vague list of tasks that I need to accomplish: read the pages, create the chart, add the information into the chart, analyze the information, and proofread the chart. But the order creates itself. I have to read the information in order to know what the chart should look like. I have to make the chart before I put information in it. The order is mandated by the project, so there is no reason to waste time planning. If something is complicated, plan it. If something takes up too much of your memory, plan it. But no matter how much you love your planner, if you plan just because you think you HAVE to, you are wasting time. And isn't the point of the planner to buy you as much time as possible? A Loyal Reader asked me to do a video on planning a project completely, including what goes where. I plan to, but since there are too many people in the house to do a video today, I thought I would go through my decision process about where to write things in my planner. But if you are new to planners, I recommend a more streamlined approach of dashboard (blank paper) and monthly/weekly or monthly/daily or weekly/daily pages (where the first part of the dated set-up is for appointments and the second part is for tasks). The reason I think you should keep a planner so simple at first is because you first need to learn to actually write things down. Appointments (time or day-specific) go on those pages, while everything else, at first, goes on the weekly or daily pages. But for more experienced planners, a strong system will tell you where to write things down. That's what my system does for me. The key parts of my system are my monthly and weekly pages, and as much as possible, everything goes there as a default. *Carpool obligations (on school days, but they vary a bit depending on my husband's work schedule), since it is important that I don't schedule something else during carpool. Yes, I should remember to pick up my kids every day. But no, I don't always remember without writing it down (and setting an alarm on my phone), mostly because I get involved in work or housework and don't notice the time. *Holidays that affect me directly, like Mother's Day, Father's Day, or my anniversary or birthday and my immediate family's birthdays. Things like my adult sisters' birthdays don't, though, since they would rarely cause me to change my schedule. Instead, they go in my weekly area. If you think of something (or receive an e-mail or invitation or flyer) and don't know where to put it in your planner, first consider whether it is a scheduled item. If so, put it in your appointment section. Most other things go in your weekly or daily task pages. *FYIs, like "husband working overtime today"
I have complicated systems of separating lists spatially, codes for the context of what I am working on (like C for "at computer"), and highlights to remind me of important stuff. But you don't NEED any of that. What you do need is one place where you can see all your tasks! If you develop subsystems and they work for you, great. If you don't, still great! You need to do what works for YOU, not for anybody else. So, if almost everything goes in those two places, what goes elsewhere??? The dashboard captures any thoughts that I don't have time to categorize. If I jot something down in the carpool line or while I am cooking supper, it often goes there. As soon as I have time to sit down with my planner, I go through the dashboard and put items in their proper places. Projects are strange, because they are usually a combination of brainstorming, lists (shopping lists), and action lists. Sometimes, they are a list of actions that must take place in a particular order, like "1. book hotel (with hotel info. ), 2. pack for trip (with packing list), cut hair (with name of stylish and appointment), and get babysitters (with a list of potential sitters), and 3. take trip." The thing is that projects STILL HAVE TO BE CAPTURED ON MY MONTHLY/WEEKLY PAGES. The details don't, of course, but if some reminder doesn't show up on my main pages, I will forget to do the project. In the example above, the tasks (book hotel, pack for trip, and get babysitters) would go on my weekly pages, but the "backup information," like the contact information, would go in the project section. The appointments (hair cut and trip) would go in my monthly section. There is an exception. Some projects, like my books that I am writing, are not on a deadline. Those just go in the projects section for whenever I feel like writing. Of course, if I schedule a day to write, get a publisher and a deadline, or participate in a writing contest, the relevant dates would go in the main part of my planner. How to tell if something is worthy of project pages? Well, if it is taking up too much space on the main pages (monthly and weeklies) or if it requires a lot of lists or brainstorming, it's a project. If something is complicated enough, it may merit it's own, temporary section. For example, wedding planning might merit it's own section. Tasks is a dumping ground for tasks that might happen, someday or maybe. Eventually, most tasks either get deleted, completed, or moved into the weekly area. But this dumping ground task list ensures that I don't have to worry about things that are nagging my brain constantly. No planner can hold enough pages. It doesn't matter how big and bulky your planner happens to be. Eventually, you will run out of space. The future pages capture those things (appointments, tasks, and FYIs) that happen after your planner's calendar ends. I suggest that you keep your notes section as trim as possible. It is for carrying information only (not active tasks or scheduled items) that you might need outside of the house. I know this post was long. But it addresses a question that comes up again and again - how to decide where to write things down in your planner. Bottom line - if in doubt, write it on your page that you look at EVERY SINGLE DAY. For more planner tips and tricks, subscribe to Giftie Etcetera. And don't forget to share with your friends on social media. With holiday travel and at least four summer trips (one Carnival Cruise, one girls' weekend, one graduation weekend, and one service weekend for my amazing high school, Louisiana School for Math, Science, and the Arts) coming up, it's never to early to start planning for packing. To see a video of my packing tips, visit here. 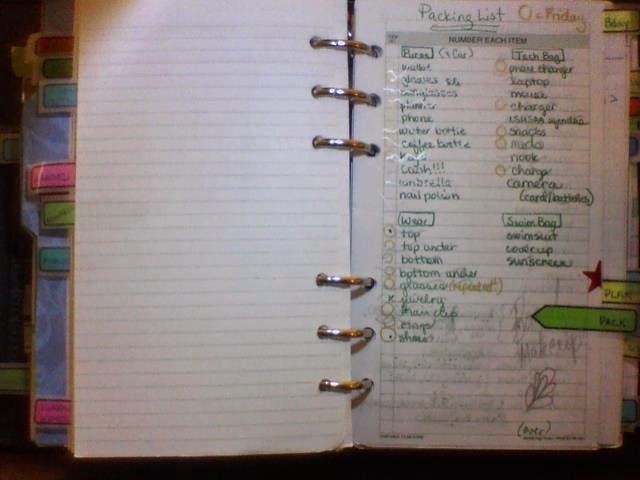 Fortunately, I have a ton of old packing lists to help me get started on deciding what to pack, stored on my laptop or in the Notes section of my planner. Once my packing list is complete, I check the old packing lists to see if I've missed anything important. Except for really long trips, I rarely pack earlier than the night before. If I pack too early, I end up needing stuff that I have already packed. I do sometimes dedicate an area for stuff that I am going to take with me and fill that area ahead of time. For example, if the trip includes swimming and I am done with my swimsuits for the week, they might go in that dedicated area. That said, I plan for packing ahead of time. In fact, I started my Easter packing list right after Christmas. My mother-in-law visited and left an insulated casserole bag at our place. I started the list with the bag as the first item to pack, as we generally visit her house sometime during the Easter holiday. *Packing lists are something that can be standardized on a laptop. However, I don't recommend it unless you are taking the same kind of trip (say, for business) over and over or you make a list, all inclusive list. Camping, flying, visiting family, or staying in a hotel (or on a CRUISE!!!) all require different packing lists. The other disadvantage of electronic lists? You can't just add to them quickly when you think of something unique that you need for the trip. If you do use an electronic list, consider putting a reminder to "check custom list in planner" at the bottom and just put custom stuff on the list in the planner as you think of the item. *Keep packing lists in your project section until after the event, labeled with the name of the event and the date. Don't destroy them after you have packed. That way, when you are ready to repack for the trip home, you can simply check the list again! *Make your packing lists in categories that make sense to you. I use different areas of the page for different pieces of luggage (like carry-on, backpack, rolling bag). Other great subcategories include by day, by activities or events, by time of day (morning, afternoon, night), or action categories, like hair styling, makeup, or toiletries. *Don't forget to pack for daytime wear, special activities clothing (like swimming, church, or elegant dinners), night wear, or exercise gear. *Put dots next to items that you need to inventory before a trip and a task in your weekly pages to do the inventory and shop about a week ahead of time. For example, I need to check on how much sunscreen we have on hand before my cruise. *Double check old packing lists in your notes or file section of your planner to make sure that you didn't forget something important. I hope many of you are blessed with at least one trip this summer! P.S. My friend Donna just wrote an excellent quick packing blog here. Go visit her page! I did a you tube video explaining how I am planning my upcoming cruise. Watch it here. *Use the system you already have for planning a vacation. For example, if you read my blog often, you know that I use a Projects section for active projects. Vacation planning is a project. Dates of travel go on my monthly calendar. Week or day-specific tasks go on my weekly calendar. *Keep tasks lists on sticky notes. Pre-vacation tasks and things to do while on vacation should be separate. I put them on sticky notes, and whatever is not done by the week before the cruise will simply be moved and stuck to the week before the cruise in my weekly pages. *Time-specific tasks go in your regular system for tracking tasks. For me, that means getting birth certificates goes on my weekly calendar, but making a sign for our door on the cruise ship goes in the task list in the projects area of my planner. *Call your bank, credit card, and cell provider a week or so in advance to let them know you will be out of the country, so they don't stop service when you buy souvenirs in the Bahamas (or so they do pause cell service). *Empty memory card and recharge all camera and electronic batteries in advance of your trip. *Order proper travel documents in advance (as in months in advance). *Teach your kids their middle names (for customs). *Make a folder for travel, including driving directions, boarding passes, luggage tags, shore excursion documents, and travel documents. For a cruise, throw in a pen and post-its and some highlighters for the daily itinerary. *Arrange for someone to check your mail and contact you in case of emergency. For a cruise, they can call the cruise line if they have your ship and room number. *Prepay bills that will come due while you are out of town. *Make an on-cruise task list, with things like setting your watch to ship time and making sure checked bags are all brought to your room. *Separate your packing lists by bag - carry-ons versus checked luggage. *Keep a list of questions for cruise forum (Carnival uses Funville Forums) in your planner as you think of them. *Have a day before the cruise checklist and a day of the cruise checklist. For example, the day before, I give myself a pedicure and clean out the fridge. I hope to post more about cruising in the next few weeks. Bonus Knowledge: My washi tape (put in my planner to protect my privacy in the video) came right off the page without ruining my writing in Frixion pen. Yesterday, my husband asked my eight year old, "how do you forget your religion book every day? Didn't Mom put a dummy sticker on your backpack? Do you know what dummy stickers are for?!?" Then, in unison, my husband and I replied, "for dummies!" My eight year old laughed and laughed. I suspect that I should regret the bad parenting (because, really, you shouldn't call your kid a dummy OUT LOUD and TO HIS FACE). But, as he just moved on and still forgot his religion book again, there's no point in apologizing, right? I put a post-it on my purse with a list of things I need to take with me, but can't pre-pack (like lunch sitting in the fridge). Post-it is now selling these custom made dummy stickers. I found mine at Target. But, really, any post-it, taped strip of paper, or washi with writing on it would work. As my Loyal Readers know, I only use my monthly calendar for appointments. 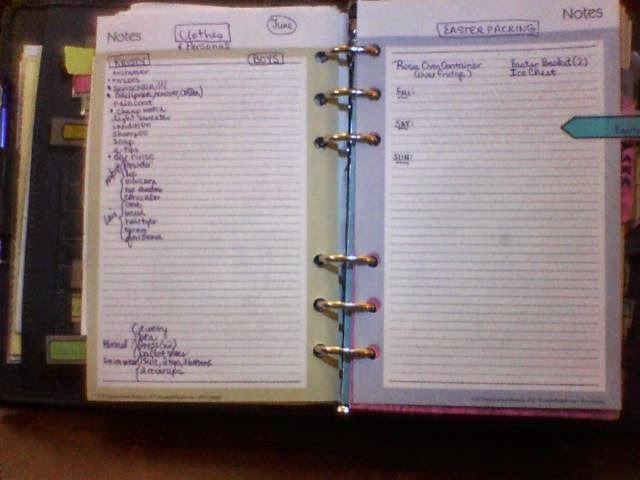 Notes, tasks, and anything else other than project planner goes on my weekly pages. But what happens when there is a big conference at work? Or a cruise vacation? I mark over several squares in my monthly calendar. I want to see the multiple day event for what it is - a big event - but I don't want to recopy the description over and over. Start with a vertical line, then add the description. Carry a horizontal line over the days. On the last day, write the description and end with a vertical line. Visually, the vertical lines create a start and stop. Also, connecting the horizontal line across tricks your eye into reading the description and noticing that those particular days are blocked out. Start planning those summer vacations!